The very first transit using the larger new locks. 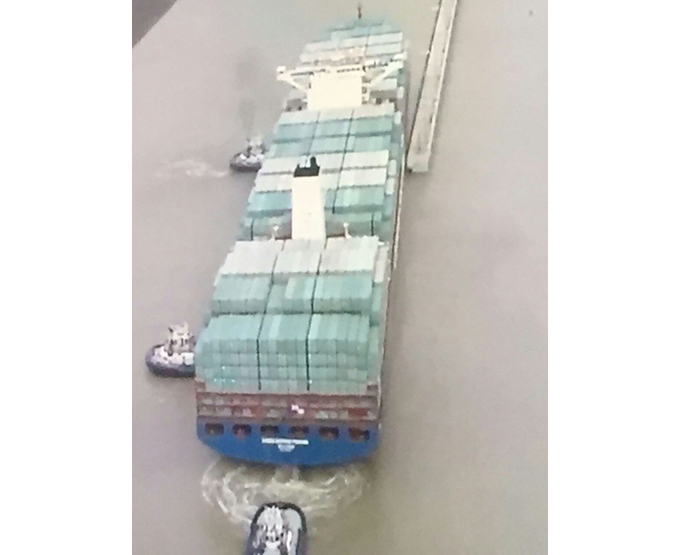 When the new locks opened, the Panama Canal Authority (ACP) had long since been warned that tricky currents and the wash from tug propellers would make ships scrape and collide with the walls. In all the hoopla of the expanded canal’s inauguration that’s exactly what happened at the start of the first transit but the ACP information control game effectively buried that video, a still from which is shown above. At the time, the rule was that for the new locks there would be six crew members on the decks of the tugs, three in front and three in back. Last year, in a cost cutting move that saves about $40 per ship transit, the ACP cut the staffing on the stern to two members and shortly thereafter, in November, there was an accident in which a tug crew member was killed. The UCOC tug skippers’ union blamed the rule change for degraded safety standards that led to the death. On April 12 the ACP announced that it was cutting the crew members on the tug bows down to two, and a number of skippers refused to work with the reduced crews. The authority suspended the tug captains and announced that it would proceed to fire them. It cited a contract provision that personnel were to obey orders and file a grievance afterward if they wish. But that clause has a exception that allows the people on tugboats to refuse to do unsafe things. At least five of the large neopanamax ships were delayed in the first day of the dispute. The ACP moved at least one ship through the canal without a tug in front. That led to protests by UCOC about “risky maneuvers.” Two big questions are whether and to what extent members of the Panama Canal Pilots’ Association (Union de Practicos) and ship owners will care to run such risks. At this point the pilots’ historically non-militant union leaders have yet to make any declarations about the situation. UCOC has long accuse the ACP of designs to privatize canal tug service. The prior plan that was discussed but not implemented, to hire a Venezuelan tug company, would likely be a political problem at this time. Rabiblanco union-bashing, featuring people with the illustrious surnames who hold or have held highly paid positions well above their talents declaring that no minority can be allowed to jeopardize the Panamanian economy, is underway as expected. Those who own businesses are so far much louder than those who manage businesses. But the ACP, whose board is dominated by construction, banking and corporate law firm interests, has crises of its own that are apart from this dispute. Two board members who are facing criminal charges and who went on the lam until their lawyers arranged bail in their absence, were removed by the cabinet for missing dozens of meetings while they were underground — except that the resolution removing them must be ratified by the National Assembly and it appears that the matter might not be taken up until July. The legislature’s ex oficio member of the board, Elias Castillo, heads a law firm that did millions of dollars of work handling transactions for the corrupt Odebrecht construction company and faces question about his own or his firm’s involvement in criminal acts. Minister of Canal Affairs Roberto Roy, who is also head of the Metro commuter train system, has been accused by one of Odebrecht’s money laundering wonks of taking a payoff to rig a Metro contract, but from Odebrecht consortium partner FCC rather than the notorious Brazilian company. Roy denies this and to date there appears to be no corroborating evidence to back the allegation. Another ACP board member, Lourdes Castillo, appears to mostly limit her board functions to defending the interest of Panama Ports, a local subsidiary of Hong Kong based Hutchison Whampoa. Against this backdrop the canal administrator’s term ends later this year and another term or a replacement will come front and center of ACP business. In the larger background, The Varela administration has but 15 months left in office. That has politicians jockeying for position in a climate of generalized public disgust with the political caste, and the many public servants on the patronage cycle grabbing or extorting what they can while they can in expectation that two years from now they will not have government jobs. So, a messy time to pick a fight? Or an ideal opportunity not to be missed? Over the years there has been occasional speculation about whether the canal neutrality treaty entitles the United States to intervene in Panama in the event of a canal strike. It doesn’t, but is vague enough that someone might argue that it does. Thus there are many opportunities to speculate, pontificate, spin conspiracy theories or distract. But the bottom line seems to be a management cost-cutting move running head-on into labor safety concerns.